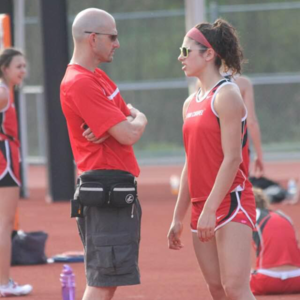 Tricia Panos graduated from Fox Chapel Area High School in 2014, but before she did she had broken the existing outdoor track record in the 100, and still holds the girls’ school records for the indoor long jump and the 60m dash. She also played high school basketball all four years. 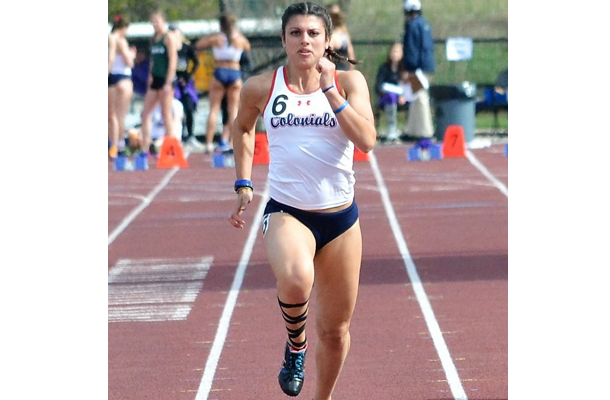 Tricia is a May 2018 graduate of Robert Morris University, where she was a successful four-year sprinter and long-jumper for the university’s indoor and outdoor women’s track and field teams. Q: What are your plans now that you just graduated from college? Tricia: Actually, I’m in the integrated program for undergrad and graduate school, so I will finish with two degrees in five years. My first degree was in marketing and now I’m attending graduate school and majoring in organizational leadership. I hope to land an event planning job once I graduate in May 2019. Q: What was your proudest achievement in your college sports career? Tricia: That would have to be placing every year at the Northeast Conference Championships. For outdoor, I placed in the 4 x 1-meter relay every season and also placed in the long jump in both indoor and outdoor. Q: What was the biggest obstacle you had to overcome to make the transition from high school to college athlete? Tricia: The biggest obstacle was to balance the different level of intensity when it came to workouts and maintaining a specific grade point average. Q: How did your high school experience prepare you for college? 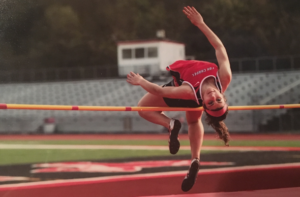 Tricia: My brain was already trained to be able to balance the various workloads between school and track and field and having that solid balance was key to having a successful sports career in college. Q: Do you think you’ll miss running? Tricia: I’ll definitely miss competing. Track and field is all I have known since seventh grade, and the team I have been a part of at Robert Morris has become family to me. But I have a love-hate relationship with running! While I am running, I absolutely hate it, mainly because after so many years of athletics, my body hurts. The love part is how running makes me feel when I am done with a long run. Tricia: I do not have many hobbies aside from the exercising category. I like swimming, biking, walking and going to exercise classes. I love to read in my spare time and take my dogs for walks. I’m always looking for new things to try. Q: What would you tell high school athletes who want to pursue varsity sports in college? Tricia: I’d say you will always have days when nothing seems to go right or how you want them to, just like you will have days when you feel unstoppable. No matter what, never stop pushing yourself beyond your limits, and never give up! Remember that practice does make perfect, but do not forget to give your body a down day. Q: Do you keep in touch with any of your high school friends? Tricia: I keep in touch with a few very close friends… Erin Mathias, Michaela Patsko, and Quintin Wirginis are three that I am particularly close with.